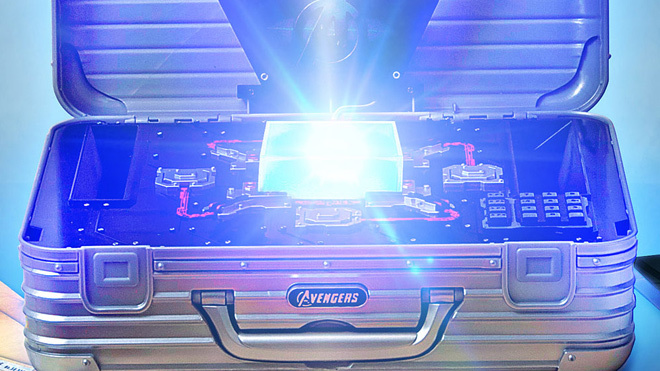 Is Anyone Buying The Avengers' Box Set thinking They're Actuallying Buying A Rimowa's Topas Case? Images of the replica briefcase on Marvel’s advertising materials, and fan video from Marvel’s product display at this year’s ComicCon convention, show the plastic ‘replica case’ to be a close copy of Rimowa’s Topas attache case in every respect but quality -- from the proportions and coloring, to the style of the handle and latches, and, of course, in the use of the trademarked parallel ridges around the body of the case. Of course, for there to be a straight trademark infringement claim, (1) they have to be competing in the same market and (2) there must be a likelihood of confusion. It's difficult to see how either thing is true. A movie box set is not in the same market as an overpriced travel case. And no one's buying one thinking it's the other. In fact, I'd think that having the replica used for the box set would likely increase interest in buying a real Rimowa case. And isn't that why the company wants its cases in movies in the first place? There's a separate "dilution" trademark claim, suggesting that this packaging somehow dilutes the company's trademarks, but again, I just don't see it. It seems to reinforce the value of the original cases, not take anything away from it. Of course, the company's actions have ensured that I'd have no interest in ever buying any of its products in the future -- in which case, filing silly petty lawsuits is likely to do a lot more harm to its brand than the fact that Marvel is playing up its style in the box set packaging for a hugely popular movie.